My momma always tells me that I shouldn’t fear, that fear is from Satan, and that I need to hold onto Jesus’ truth and his power and the knowledge that God is so much bigger than my fears, and that I need to let go of my fears. While I understand this and agree with this, I have to be honest and tell you, I’m scared out of my mind. I guess that makes me human. 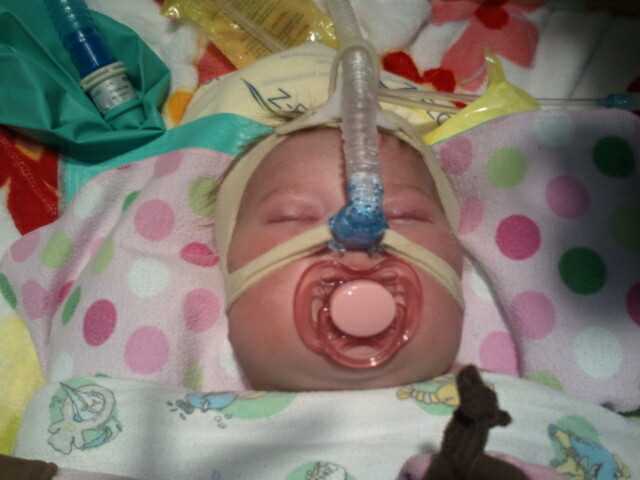 Annabelle is still on the CPAP machine, but she is on the highest settings possible at the highest oxygen level possible. And she keeps barely in the “okay” margins of her O2 sats. They talked in doctor’s rounds this morning about the possibility of electively intubating her until she has her new heart. Right now, they understand Scott and I want to avoid that if possible, so we are keeping her on CPAP at her high settings. 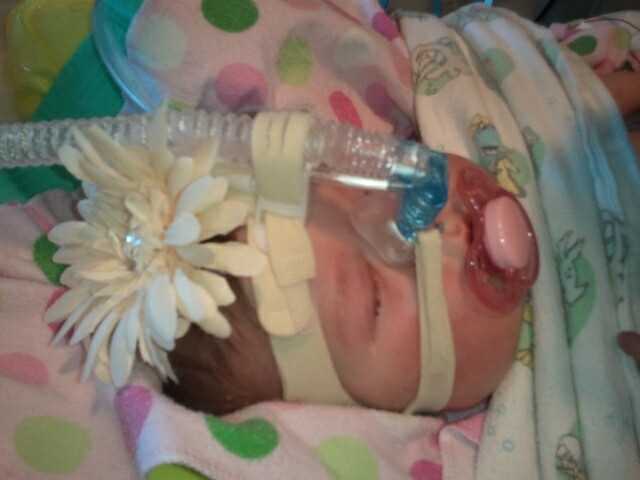 But if she keeps dipping and can’t recover, we’ll have to put her back on the ventilator until she gets her heart. And considering that could be months from now, that’s a very scary thing for us. What is frustrating is that we really don’t know WHY all this happened, except that she ran a fever and had a really tough time recovering from it. She is now fever free, and we are having a low low tolerance for fevers so are giving her Tylenol if she even gets close, and keeping a cooling blanket underneath her and turning it on when she starts to warm up at all. All her viral cultures and blood cultures came back negative, which is a good thing because it means we can proceed forward with a heart if one comes available. But it also means that the problem is most likely poor function of her heart, which isn’t likely to get better until she gets a new heart. We aren’t ruling out yet our “2nd opinion” from Boston, however everyday I’m becoming less and less convinced that this is what God wants us to do. I guess I feel that if she’s having such a hard time with her current heart right now because of it’s function, what is it going to do when we try to tax it and use the whole thing? That said, Scott and I are still wanting to, if possible, get the MRI done to completely rule it out. Mostly this will help us know for sure it’s not an option we should be considering, so we don’t second guess ourselves later. But we won’t do so at the expense of Annabelle’s heart. We are tentatively scheduling it for next Thursday. Please also pray that Monday is a VERY BORING DAY here at the hospital. I’m leaving on a business trip… it’s just a one day leave in the morning come back in the evening type thing… but it would be really hard if something happened while I was gone. It DID make me feel better that the transplant coordinator said that usually, for some reasons, they seem to get more calls about hearts at night. That made me feel MUCH better about going… although I know there is always a possibility. That said, if God wants to answer this prayer by allowing a heart to come BEFORE I leave… I will gladly stay here!!! Update on Annabelle’s friend, Anna Reese. She’s doing a little better!!! They successfully got her off ECMO (if you remember, Annabelle was on that for two days when she crashed after her first heart surgery) which is a HUGE HUGE step. She’s stable right now, but still has a ways to go, so your continued prayers for her are appreciated as well! We are DETERMINED to get the Anna’s well so they can be heart friends and play together when they are older!! Words fail me except to say that I am praying for a heart for Annabelle and continued strength for all of you. Also, that Monday will be a very quiet day. I remember there was a time in Joshua's life that he started having problems with his Sats and we later found out it was because he was dehydrated. I know that your doctors are monitoring her I's and O's, but have they ruled dehydration out? It sound so stupid, but I just thought I would ask. I am praying for all of you. It's ok to be be afraid. Just don't let that fear rule you. That's something I learned very quickly with Joshua. God created our emotions and our feelings and it's ok to feel the, just don't let them over come you and paralyze you. Oh Krista, I'll be thinking of you Monday. How tough to be away!!! Krista, the gist of Matt Hammitts digging deeper for jan 18 2011 is valid for you – (not the arrogance part!) just the general principal…kinda what your momma said. Jill, a great point. Unfortunately, her xrays have showed VERY wet lungs for the last few days too… it was finally better today, but this is after changing her diuretics from q8 per tube to q6 IV. They also have her on fluids since she isn't being fed right now (personally, I think my sats would drop if you didn't feed me for two days too!!!) But… they want to keep her NPO (is it sad that I know what that is?) just in case they have to intubate… starting TPN's and Lipids tonight. That said… it is a possibility that they've gone overkill on the diuretics… Not sure how positive her I&O's are, will check though!!! Totally agree about not letting fear rule you. I think I've tried to be "not fearful" but at the same time, I was almost lying to myself as I was really scared. It kinda was freeing to allow myself to state the truth. Now, I can work on letting God help me overcome it. Praying for Annabelle. I've also got her on my email update prayer list. Krista, my prayers are with you. May you feel the loving arms of the Lord upholding you as you prepare to leave on your business trip, and may things back home be unusually calm that day. Krista, I don't know you, but I have been following your blog for months now. I found it from Bowen's blog. I have also been following Emma's blog in Texas. I wish I could just hug you because I really don't know what to say, but since you have to leave words on a blog…hear it goes HUG – that's a big hug! Thank you for sharing your journey. After six months we are still seeking treatment for our 3 yr old Daniel in the U.S. – it is a miracle he is alive, but the Lord seriously coordinated his defects to keep him alive until he could get medical care. We keep praying for the Lord to open and close the right doors – so far only two that are slightly ajar! I had to stop by and tell you that I am still praying for you and your baby girl. I am so so sorry for all that she is going through–you both are amazing.